Ken has performed all over Britain and has made numerous TV and radio programmes. He has appeared on the Royal variety show at the Palladium on a number of occasions. He was a boy ventriloquist and made an early appearance at the Flat Lane Labour club, Ellesmere Port, earning three and sixpence (seventeen and a half pence). Ken turned professional in 1954 and has been waving his tickling stick ever since. Ken’s first record was’ Love is like a Violin’, recorded in early spring of 1960 and by the autumn it was at the number one slot. He went on to record ‘Happiness’ in 1962. Ken tells me that in 1965 he played the London Palladium for forty-two and a half weeks. While there, he recorded two songs at Abbey road studios. They were ‘Tears’ and ‘The River’. He told me that ‘Tears’ sold over two million copies and ‘The River’ earned him a silver disc. Tell your friends and do get Your Tickets early!! £10. 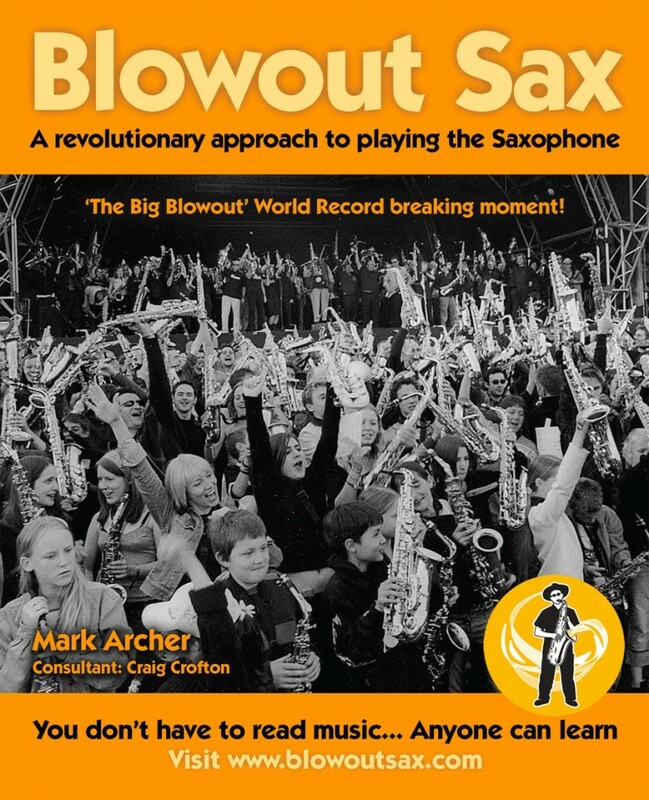 One of the things that sets Blowout Sax apart from other forms of instrumental tuition is the performance aspect. At every Blowout gig there are in excess of 60 plus enthusiastic students showing off their new found skills in a very professionally organised performance. 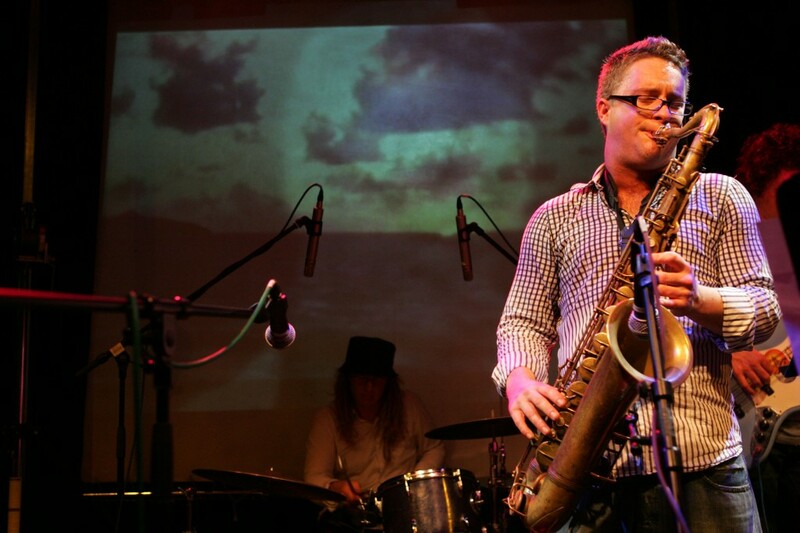 The backing band is always made up of top Bath and Bristol session musicians and the band is run by the incredible talent of top American sax man and long-time Blowout Sax stalwart Craig Crofton. 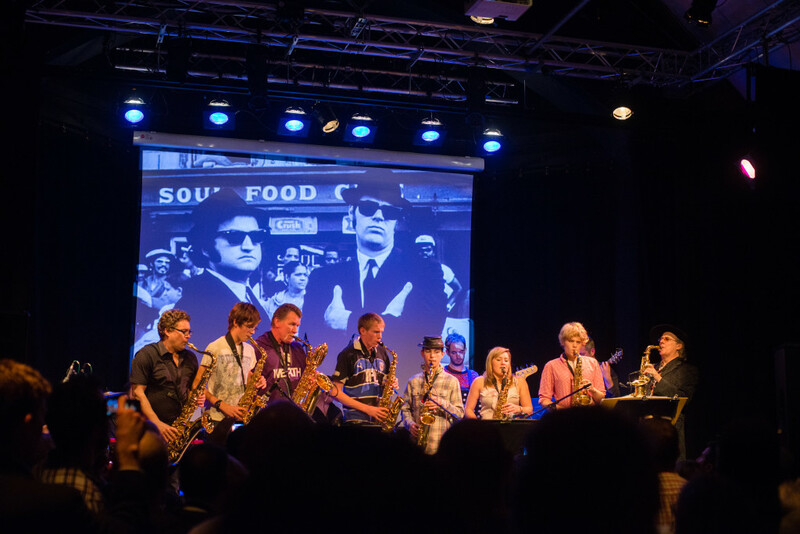 “Students will be playing pop, blues, soul, funk and some ska/reggae. It’s classic party tunes, basically, from One Step Beyond to Baker Street, Pink Panther to Your Latest Trick it’ll all be there ” says Mark. “We get a top class band with session musicians from Bristol. We’re giving people the experience of playing live; it gives learning a focus, a goal. This the 17th year of this gig and always been a sell out. I love your videos. You get me excited about playing my saxophone. You delivery and enthusiasm is contagious. I play the Alto sax. 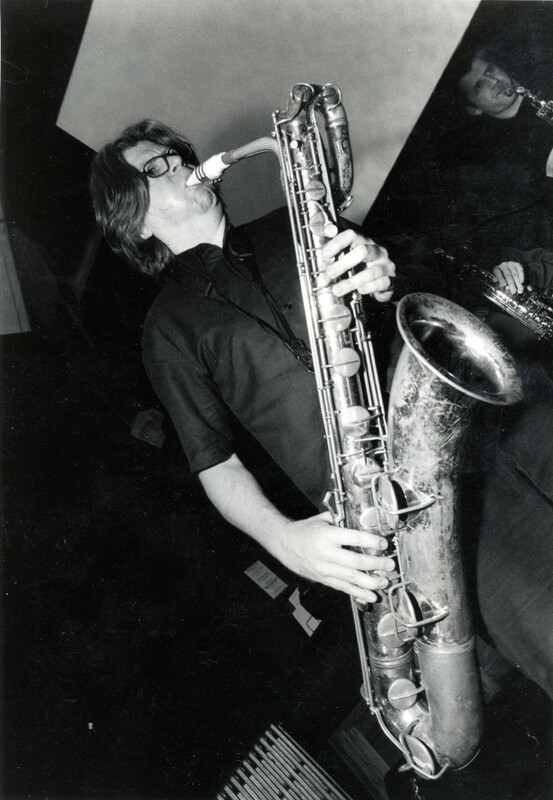 I have loved the sound of a sax forever and at the young age of 60 I bought one. I can read music but I am always open to new ideas. You can teach an old dog new tricks. Wish I had bought one 30 years ago. I just bought your book (A revolutionary approach to playing the saxophone) and noticed the references to a CD. Can I purchase separately or pay to download? The cds of the music are available upon request from me. We’ve splashed out on the exceptional hypnotic, pulsing composition trio Modulus III (Drew Morgan, Dan Moore, Matt Brown). We’re hoping for a really good turn out for a May evening up at the Old Barn and a great reception for Modulus III: they’ll surprise us and we plan to surprise them. Top notch food by Michael Holloway and fresh local beer and cider available. We’re also introducing support acts to showcase new bands: on 6 May Modulus III are supported by Athea, a new project by our old friend Paul Bradley, working with percussionist Emma Holbrooke. Do come back with any queries; hope to see you there! As hoped, The Gas Giants will be playing (and being recorded for a future release on Kelston Records) at the Old Barn, Kelston Roundhill on Saturday 20th May. 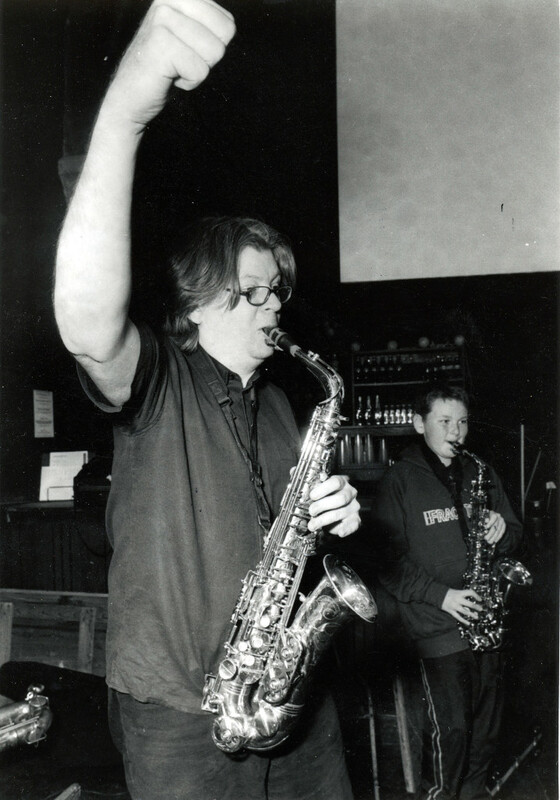 The rest of Gas Giants are multi-instrumentalist Ross Hughes (of live Portishead) and legendary local drummer Tony Orrell (The Pushy Doctors) will be performing in the UK for the first time in two years.